R. Hoe & Co No. 5703 at the Center for Book Arts with its new tympan and frisket. The HVAC duct doubles as the frisket stop. After two solid days of all things hand press (and beyond), it would have been hard to imagine a more a propos final session than Richard Minsky and Amelia Fontanel’s talks on the restoration of three iron hand presses. 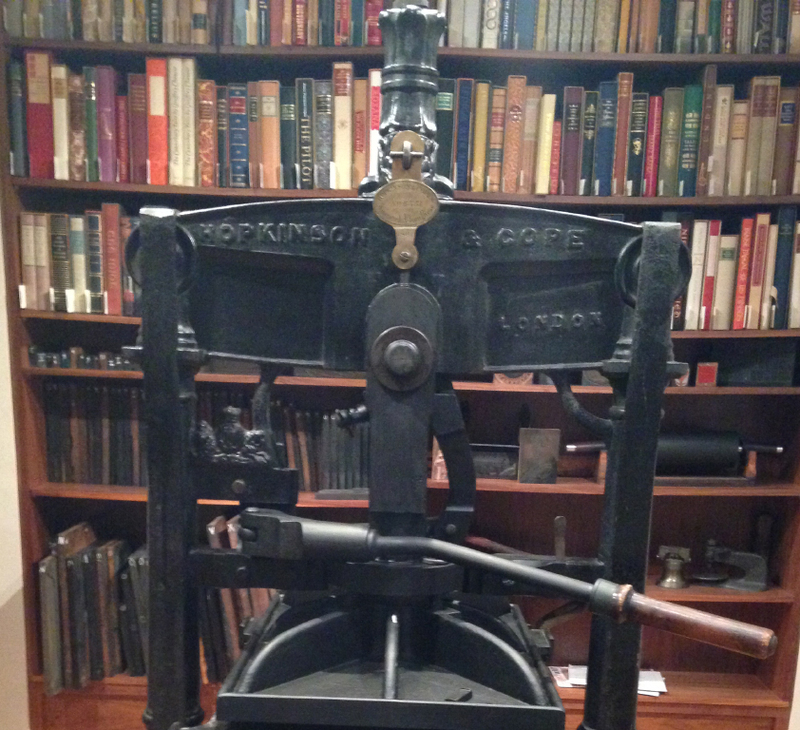 Minsky, who started the Center for Book Arts in New York in 1974, described his restoration and adjustment of two presses: an 1839 Albion made by Hopkinson (No. 1016) and an R. Hoe & Co. Washington press (No. 5703). The Albion is owned by Yale University, and has resided for many years in the Sterling Memorial Library. It was used by Yale’s first University Printer, Carl P. Rollins. Minsky described the state of the press when he began: broken girths, damaged ribs, and an obvious but hard to diagnose problem with the travel and height of the carriage. With some detective work and much mechanical sense, he found that in a previous move or refurbishment the ribs had been installed incorrectly on the frame, creating the height problem and making the carriage travel too far on the rails. Several strong men and a fairly simple reorientation, along with some experimentation that threaded the carriage strap correctly, solved the problems so the machine could operate as it had been designed. With adjustments to the platen, the Albion was successfully returned to service, and is regularly used for teaching in the library. Components had been modified or disappeared entirely. Minsky described restoring the tympan and frisket, adding a full-bed steel chase, and other adjustments that ultimately returned the press to service. 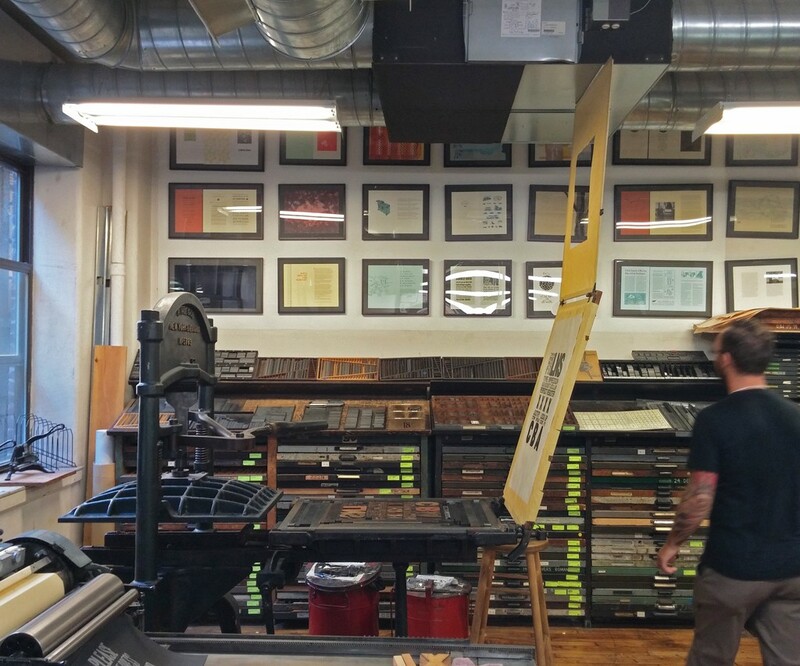 It is now in regular use for teaching and production by the Center’s Master Printer Barbara Henry and others. The Kelmscott/Goudy Albion now at The Cary Graphics Arts Collection. Amelia Fontanel began her presentation on the Hopkinson & Cope Albion press # 6551, owned by a starry list of printers beginning with William Morris, and continuing through Frederic Goudy and Ben Lieberman, and now part of the Cary Graphic Arts Collection at RIT, with some clarifying words about her presentation title, “One Press to Rule Them All.”With references to J.R.R. Tolkien out of the way, Fontanel chronicled the extraordinary excitement and notoriety this particular Albion press has trailed, particularly in its move to Rochester. The press, one of whose owners was RIT benefactor Melbert Cary, had long been a desideratum, but when its unexpected sale at auction was announced in 2013, RIT alumnus Brooks Bower provided a pledge that made RIT’s bid possible. At the fall of the Christie’s gavel in December, 2013, the press headed for Rochester. With its arrival in January, 2014, Fontanel began a thorough assessment and complete overhaul. Although the staple was in good condition, most of the working parts of the press were rusted. In her words, “rust begets rust,” so began 8 months of stripping and recoating each piece. The restoration was painstaking, and each step was meticulously recorded. Fontanel relied heavily on a variety of resources: the Cary Collection itself, an international network of consultants, including staff from Kelmscott Manor in England, which holds another of Morris’ three presses, and the expertise of Cary Collection Curator Emeritus David Pankow. The RIT campus also provided resources, including the Mechanical Engineering department machine shop which provided several newly made replacement pieces. Fontanel explained that the press’ restoration involved minor modifications, such as the use of modern materials to replace vellum or canvas in the tympan assembly. Because the press is intended for teaching, she argued that these instances of innovation on historical methods build educational validity and relevance for the students. Fontanel concluded with some thoughts on an idea put forth by Fred Goudy in a book called Design and Beauty in Printing (1934) “Certain of us find pleasure in assuming to be trustees—self-appointed executors the bequests of the great craftsmen of bygone ages and we, who assume such trusteeship, in turn, pass on to those who follow, the legacies that great geniuses leave to mankind.” The Kelmscott-Goudy press has been the medium for great works in the history of printing in the last 150 years, and with its acquisition by RIT, and the meticulous work performed by Amelia Fontanel and her team, the trusteeship is assured for generations to come. The “One Press to Rule Them All” is now in regular use, and many APHA conference participants took their turn at pulling the historic bar, printing copies of the beautiful Conference keepsake.